One of the strengths of the Dulwich Players is the group's willingness to branch out from the staple fare of plays that make up the usual repertoire of amateur groups. 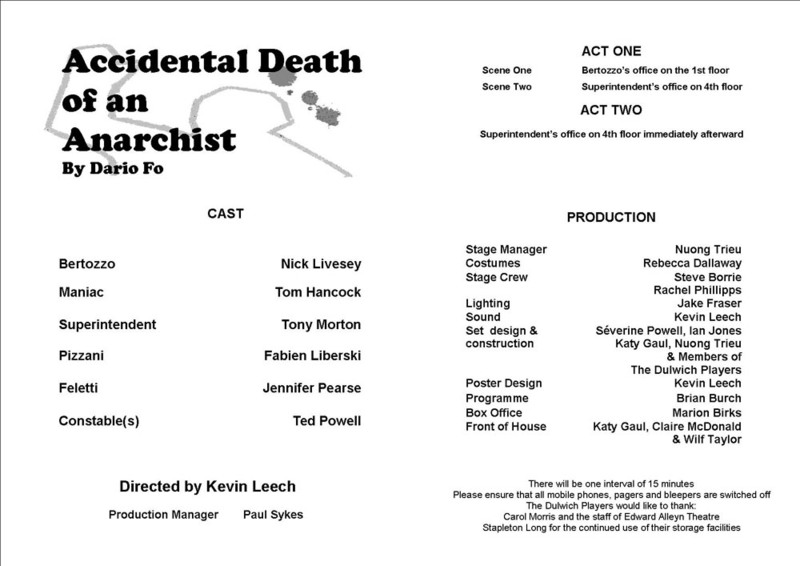 The choice of "Accidental Death of An Anarchist", a fast-paced, anarchic political farce, as a main production was a good illustration of this principle. When you combine this choice of play with the fact that the production was directed by a first-time director with a cast largely new to the Dulwich Players, you have an interesting recipe - will the reputation of the Dulwich Players for producing quality production be maintained, even enhanced, or will we be picking up the pieces of a turkey? Before I give a view, I can hear voices arguing that as Production Manager, my view would be biased. However, I would argue that it's worth bearing in mind that due to other commitments, I didn't see too much of the rehearsal process so when I saw the play for the first time in its entirety it was on the first night. So, what is the verdict – soaring lark, or stuffed Turkey? I have to say I was impressed and mesmerised. It was a production the cast, the director and the Dulwich Players can feel very proud of. The acting had to be energetic, fast-paced and the repartee like a verbal tennis match. On the one hand this can be onerous on a small cast, but it does give a chance to really gel and produce a honed team effort. OK, there were one or two slips but in such a verbal tour de force of a production they are to be expected. But my overall impression was one of energy and quality. In a farce, the acting has to be larger-than-life to keep the audience engrossed. The central performance depends on the capability of the Anarchist to keep the energy level high and to keep the pace cracking along. Tom Hancock's performance did this perfectly. His energy and verbal dexterity in producing a range of characters were impressive and his performance anchored the rest of the play. Sometimes it is the little touches that make a performance memorable and I was particularly taken with the business he developed around the wooden hand. Nick Livesey's performance as the inspector really came up trumps; he combined a sonorous, strong voice that reached every corner of the theatre with a terrific energy level which conveyed the mounting frustration of this bewildered policeman. Tony Morton, Fabian Liberski and Ted Powell as the other policemen gave the production a range of well-rounded characters who were sucked into the madman's plot to expose their corruption. Ted managed to get most of the laughs of the evening as the bored uniformed policeman but I felt that if one character had more potential, it was his. Sometimes the smaller parts can be really developed to become memorable and such was the comic potential of his part. Jenny Pearse's appearance was well worth the wait. She quickly established her presence on stage as a no-nonsense, sensible journalist amidst a sea of recriminations, denials and lies. Although deceptively simple, the set provided the atmosphere of grubby institutionalism; sparsely furnished offices reflecting the unwholesome activities of this police force. A pat on the back to Severine Powell and Ian Jones for the design and construction of a set which had to be rock solid. It was. I can't pass the opportunity to comment also on the surreal backdrop used to convey the different levels of the building; it was a great piece of artwork from Katy Gaul and Nuong Trieu. We have got used to having good lighting in our plays and we tend to forget that the young man responsible for producing the atmospheric lighting in this play which did much to add to the drama; think of the finale with the red light growing smaller and smaller, is thanks to Jake Fraser who has been busy studying for his A-levels at the same time as doing this play. Finally, we come to Kevin Leech, the Director. For a first time production I would say "Didn't he do well!". I know Kevin found the journey from start to finish something of an odyssey but I also know that having been through this particular crucible he has learned much which will stand him in good stead for his future productions.